Anyone with children will understand the conundrums of the magazine aisle where, according to a child I overheard recently, “you get a free comic with these toys.” The same claim could be made about the B’Twin Facet 7. It’s not one for the bike snobs, but adding together the price of the wheels and groupset separately, the frame is practically thrown in for nothing. What’s not to like? B’Twin is owned by French sporting goods chain store, Decathlon. The store, now in 18 countries, adopted the name B’Twin in 2006, replacing the Decathlon Cycle logo on their bikes. This new line, that the Facet 7 headlines, is a sleek range which will appeal to cyclists looking for quality components at a staggeringly low price. So low, in fact, that there can’t be too much room for margin. The Facet 7 frame, as ridden by the French squad U19, is made from T800 unidirectional — or UD — carbon. Catch the frame in the light and you can see the marble effect of the raw carbon beneath a superb matt black finish. Little touches of anodised red bottle cage bolts and a 5mm spacer on the steerer complete its stunning looks. The ‘free’ frame has a tapered head tube amplifying from 1”1/8 at the top to 1”1/2 at the bottom. Bladed aero forks complete the front end. They perform well and give precise handling and what’s more, they weigh in at a very nimble 320g. Fitted onto the carbon seatpost is a Prologo Nago saddle, but further down the seat post, the clamp’s size meant it was intrusive when riding in the saddle. Due to its size, it brushed the inside of my thighs; a problem that is likely to be exacerbated the more the seatpost is exposed. A matching alloy Deda Zero 2 compact handlebar and stem combo make up the cockpit. Inspiration could’ve been taken from a stealth bomber for the frame’s design, but it retains an awful lot of the elements of their Ag2r Prévoyance team bike from 2007. Turn the clock forward half a decade and this new frame weighs substantially less. The claimed weight for the 57cm frame is a not-too-shabby 1,150g. Stealthy looks carry over to the Mavic Cosmic Carbone SLR wheels. Mavic was right on the money with the aesthetics of these wheels. They’re part of a range that features their black Exalith braking surface and 3M reflective rim stickers. They have the pro look of tubular rims without the hassle and the added bonus of enhanced braking power — even in the wet — on an easy-to- live-with clincher. The wheels are laced with flat ‘R2R’ (Rim 2 Rim) carbon spokes that provide a lot of stiffness that’s most noticeable going through corners. The reassuring handling in the bends is backed up with great power transfer to enable the rider to accelerate out of bends. The downside is that the wheels are noticeably harsh on rough road surfaces and aren’t the most stable in crosswinds. In keeping with the SSC label, Mavic Yksion Griplink Pro 23mm tyres come with the wheels. The SSC label stands for ‘Special Service Course’ and means that products displaying this logo have been developed in close collaboration with top athletes and teams such as Garmin-Sharp. Mavic, although not responsible for popularising the electronic groupset, was an early pioneer of the concept. It developed a system called Zap in 1992 and it was put into use at that year’s Tour de France. Therefore the idea wasn’t new when Shimano brought out its Dura-Ace offering in 2009, but when the Japanese manufacturer adopted it, the cycling world sat up and took notice. Now, everyone’s at it and the trickle-down in technology means that it has become affordable, and somewhat common, to pick up a bike with it already onboard. When Shimano launched its Ultegra Di2 groupset the landscape was totally repainted. If Dura-Ace Di2 changed it, it only really changed it for the pro peloton or the affluent. Ultegra has brought it to the masses. Switching between the old 10-speed Dura-Ace to the first generation Ultegra Di2, hardly any difference would be noteworthy in a blindfold test. The rear mech shifted without fault every time. The front mech had the same whir, and again, shifted seamlessly. At that point the Ultegra version was slightly heavier, but with the data and feedback that the engineers had received from the initial launch of its top-tier sibling, they made the Ultegra function better. For instance, it was then made fully waterproof. Hard to imagine, but it’s true that Shimano couldn’t claim that the first electronic groupset was 100 per cent guaranteed to work without fault in the wet. A bike with this ticket price is an incredible offering. 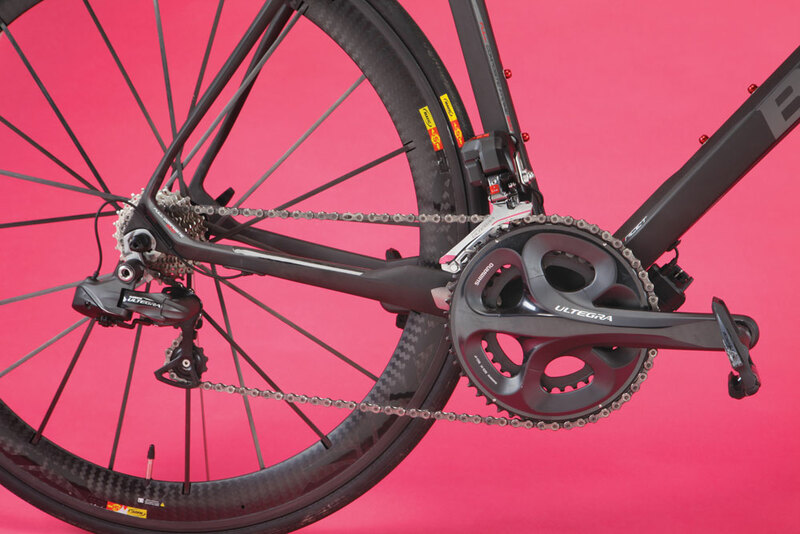 The bike comes with a compact chainset (50/34t) and a 12-27t cassette. It’s a standard combination that works best for the majority of cyclists. The battery is housed underneath the bottom bracket and has the cabling running to and from it via internal routing, keeping the frame’s silhouette neat and tidy. In fact, ‘neat and tidy’ sums up the Facet 7. The frame is well produced and it’s difficult to find fault with the 7.4kg ‘free’ frame, especially when it’s laden with such fine components (we’ll ignore the seatpost clamp for now). If this is a move by B’Twin’s owners, Decathlon, to offer a premium product to its customers with a price in keeping with its ethos, then there’s only one question left unanswered. How is the company making any money? Shimano’s 11-speed Di2 trickle-down tech has now reached Ultegra. The introduction of the 11th sprocket to its Dura-Ace Di2 doesn’t seem all that long ago, for good reason — it’s barely taken the Japanese a year to do a proverbial hand-me-down to its little brother. Materials, as in most circumstances, are slightly compromised, but pro-peloton performance isn’t. 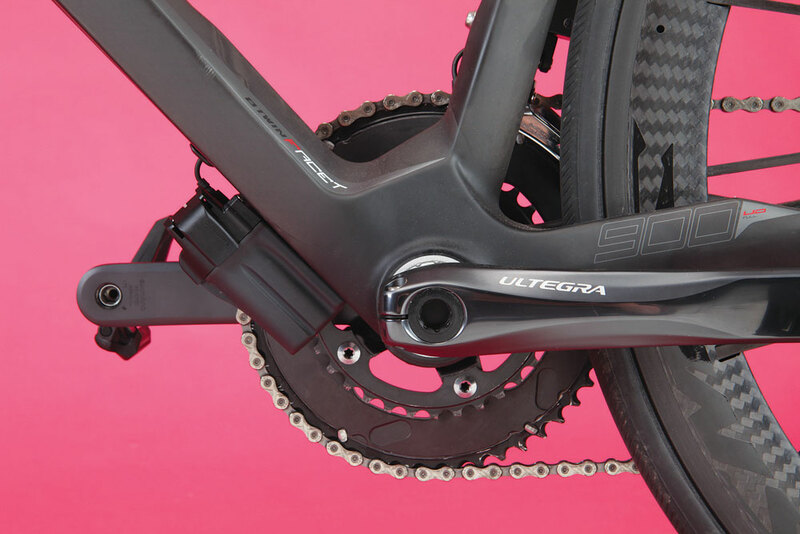 Ultegra 6870, as it’s effectively known, gives the option of running a sprinter’s button inside the drops or a climbers/classics version, where the button is positioned on the tops, just like Dura-Ace. But, what it has over its big brother is a choice of rear mechs, the standard short reach mech, for anything up to a 28t cassette, or a new longer GS version that’s capable of a navigating a whopping 32t cassette. We could well see the teams opting for a 6870 rear mech for the leg-benders at this year’s Vuelta. B’Twin was the bike sponsor for the Ag2r-Prévoyance for the 2007 season. When riding their ‘Full Composite 700’ (or FC 700), Christophe ‘Le Chien’ Moreau won the prestigious Critérium du Dauphiné Libéré stage race, as it was then known, as well as the French National Championships. The B'Twin Aerofit bibshorts claim to offer pro-level performance, at a not-so-pro price. Here is our review.